Generously brush the bottom and sides of the Rockcrok® Dutch Oven with oil and set-aside. For the cake, combine all the ingredients according to the package directions. Pour the batter into the Dutch oven and microwave, covered, on HIGH for 9-11 minutes or until the center of the cake is firm and the cake springs back. Cool, uncovered, for 10 minutes and invert onto a Cutting Board. Chill the cake in the freezer for 5 minutes or until the top is cool to the touch. If the top is uneven, trim the top of the cake with the Forged Bread Knife. For the frosting, beat the butter and shortening with an electric mixer on medium speed until it’s light and fluffy (about 1 minute). Add the water and vanilla and beat on low speed. Gradually add the powdered sugar and continue beating on medium speed for about 3 minutes or until all the sugar is incorporated. Place the Closed Star Tip on the large Decorating Bag and fill the bag with the remaining frosting. Starting on the outer edge of the top of the cake, pipe rosettes around the cake, moving toward the center (see Cook’s Tips). Top with the white sparkling sugar, if desired. To slice the cake, cut the cake in half with the bread knife. Cut each half into 8 thin slices. 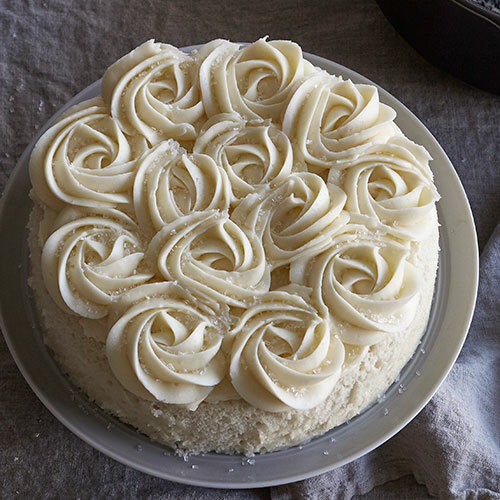 Using egg whites in the cake will give you a shorter cake with a more intense white color. The egg yolk version will give you a taller cake with a yellow tint. To make your rosettes, start with the tip in the center, then slowly move your tip in a circle around the center point. Try to end in the same place every time. Your rosettes will be touching one another. About 1 cup (250 mL) of frosting will be left-over. Use the extras to practice decorating prior to decorating the cake.